The modern chapter heading of 1 Nephi 1 indicates that the opening events began “about 600 BC.” For hundreds of years, the Nephites measured time by how long it had been since Lehi left Jerusalem.1 Knowing exactly when Lehi left would go a long way in figuring out the timing of many other Book of Mormon events. Shortly after Nephi and his brothers returned, Lehi prophesied that in “six hundred years from the time [he] left Jerusalem, a prophet would the Lord God raise up among the Jews—even a Messiah, or, in other words, a Savior of the world” (1 Nephi 10:4; 19:8; 2 Nephi 25:19). Since Christ was born around 5 BC,8 there’s obviously less than 600 years between either 597 or 588 BC. 1. See 2 Nephi 5:28, 34; Jacob 1:1; Enos 1:25; Jarom 1:5, 13; Omni 1:3, 5; Mosiah 6:4; 29:46; 3 Nephi 1:1; 2:6. 2. It’s possible that the original text of the Book of Mormon simply read “in the commencement of the reign of Zedekiah,” without “first year of the.” In the Printer’s Manuscript (the Original is not available here), “first year of the” is inserted above the line. See Royal Skousen and Robin Scott Jensen, eds., Printer’s Manuscript of the Book of Mormon, 1 Nephi 1–Alma 35, Revelations and Translations, vol. 3, part 1, The Joseph Smith Papers (Salt Lake City, UT: Church Historians Press, 2015), 21. Royal Skousen, Analysis of Textual Variants of the Book of Mormon, 6 parts, 2nd ed., Book of Mormon Critical Text Project, vol. 4 (Provo, UT: FARMS and BYU Studies, 2017), 1:59 considers this just a copyist error, but it’s possible “first year of the” was not in the original text. While this seems like an insignificant difference, based on how ancient Israelites likely counted regnal years, the commencement of the reign of a king and the commencement of the first year of the reign of a king could indeed refer to different time-periods. See Neal Rappleye, “Jerusalem Chronicle (ABC 5/BM 21946),” Nephite History in Context 1 (November 2017): 1–5, esp. n.19 for a detailed explanation. 3. See Jack Finegan, Handbook of Biblical Chronology, rev. ed. (Peabody, MA: Hendrickson Publishers, 1998), 256 §437. Finegan gives the date at March 16, but this is based on the Julian calendar. March 10 is the corrected date based on the Gregorian calendar we currently use. See Rappleye, “Jerusalem Chronicle (ABC 5/BM 21946),” 1–5, esp. n.15. 4. See Jay H. Huber, “Lehi’s 600-Year Prophecy and the Birth of Christ,” FARMS Preliminary Report (1982): 22; Robert F. Smith, “Book of Mormon Event Structure: The Ancient Near East,” Journal of Book of Mormon Studies 5, no. 2 (1996): 98–101, 122–123; David Rolph Seely, “Chronology, Book of Mormon,” in Book of Mormon Reference Companion, ed. Dennis L. Largey (Salt Lake City, UT: Deseret Book, 2003), 197–199. 5. Smith, “Book of Mormon Event Structure,” 125. 6. Randall P. Spackman, “The Jewish/Nephite Lunar Calendar,” Journal of Book of Mormon Studies 7 (1998): 48–59, 71; Randall P. Spackman, “Introduction to Book of Mormon Chronology: The Principal Prophecies, Calendars, and Dates,” FARMS Preliminary Report (1993): 6–12; Jerry D. Grover Jr., Translation of the “Caractors” Document (Provo, UT: Grover Publications, 2015), 70–73, 209–210. Brant A. Gardner, Second Witness: Analytical and Contextual Commentary on the Book of Mormon, 6 vols. (Salt Lake City, UT: Greg Kofford Books, 2007), 1:66 n.25 says that he follow’s Spackman’s chronology. 7. S. Kent Brown and David Rolph Seely, “Jeremiah’s Imprisonment and the Date of Lehi’s Departure,” Religious Educator 2, no. 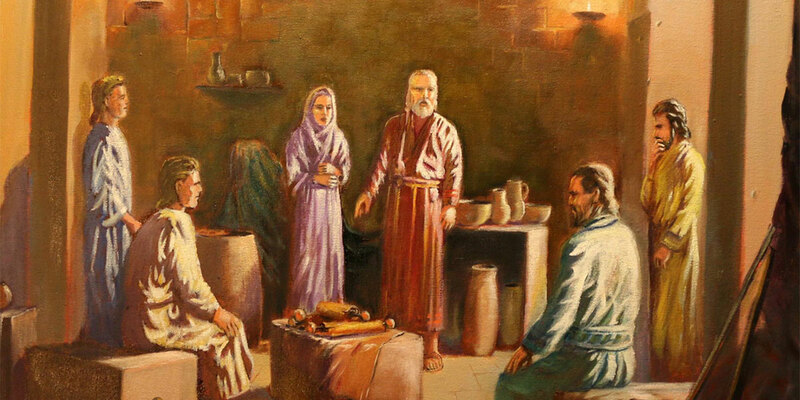 1 (2001): 15–32; Book of Mormon Central, “How Could Nephi Have Known about Jeremiah’s Imprisonment? (1 Nephi 7:14),” KnoWhy 463 (August 30, 2018). 8. See Book of Mormon Central, “How Does the Book of Mormon Help Date the First Christmas? (3 Nephi 1:13),” KnoWhy 255 (December 21, 2016); Jeffrey R. Chadwick, “Dating the Birth of Jesus Christ,” BYU Studies 49, no. 4 (2010): 5–38; Lincoln H. Blumell and Thomas A. Wayment, “When Was Jesus Born? A Response to a Recent Proposal,” BYU Studies 51, no. 3 (2012): 53–81; John A. Tvedtnes, “When Was Christ Born?” Interpreter: A Journal of Mormon Scripture 10 (2014): 1–33. 9. Jeffrey R. Chadwick, “Dating the Departure of Lehi from Jerusalem,” BYU Studies 57, no. 2 (2018): 7–51. 10. For background on Mesoamerican calendrics, see Mary Miller and Karl Taube, An Illustrated Dictionary of the Gods and Symbols of Ancient Mexico (London: Thames and Hudson, 1993), 48–54; Janine Gasco, “Calendrics,” in Archaeology of Ancient Mexico and Central America: An Encyclopedia (New York: Routledge, 2001), 90–92; John S. Justeson and Terrence Kaufman, “Calendars and Calendrical Systems: Mesoamerican Calendar,” in The Oxford Encyclopedia of Mesoamerican Cultures: The Civilizations of Mexico and Central America, 3 vols., ed. Davíd Carrasco (New York: Oxford University Press, 2001), 1:121–24. Among the Maya, the terms tun and haab were actually interchangeable for both the 360-day and 365-day period, demonstrating that they regarded the 360-day period as a “year.” See Neal Rappleye, “‘The Time is Past’: A Note on Samuel’s Five-Year Prophecy,” Interpreter: A Journal of Mormon Scripture 29 (2018): 25–27. 11. John L. Sorenson, An Ancient American Setting for the Book of Mormon (Salt Lake City and Provo, UT: Deseret Book and FARMS, 1985), 273. For a full Book of Mormon chronology using the tun as the year, demonstrating that 600 tuns can be counted off using from a May 596 BC departure to a September 5 BC birth of Christ, see Robert F. Smith, ed., Book of Mormon Critical Text: A Tool for Scholarly Reference, 3 vols. (Provo, UT: FARMS, 1984–1987), 3:1321–1325. 12. Finegan, Handbook of Biblical Chronology, 31–32 §61. 13. Spackman, “Jewish/Nephite Lunar Calendar,” 57. 14. For example, when taken at face-value, the combined chronologies of Israel’s and Judah’s kings add up to different totals for the same time-span, and both are too long to be consistent with external dates. See Edwin R. Thiele, The Mysterious Numbers of the Hebrew Kings, new rev. ed. (Grand Rapids, MI: Kregel, 1983), 15–17, 36–37. 15. On this confusion, and the possibility that the use of different ancient calendars contributed to it, see Rappleye, “The Time is Past,” 21–30. Also note, Samuel’s prophecy said, “Behold, I give unto you a sign; for five years more cometh, and behold, then cometh the Son of God to redeem all those who shall believe on his name” (Helaman 14:2). Samuel’s words did not say how many months after the remaining five-year repentance time would see the coming of the Son of God. 16. See Tvedtnes, “When Was Christ Born?,” 15–16.